Frank Gehry is the Rorschach test of modern architecture. 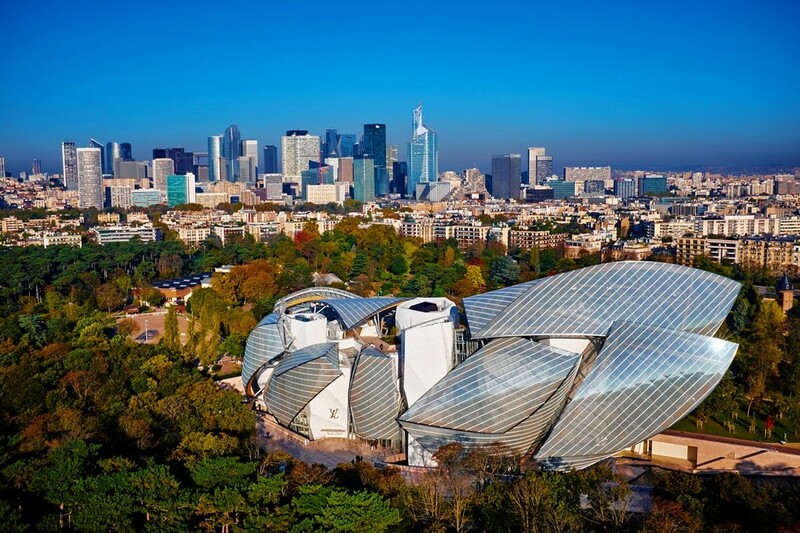 And his latest creation – Fondation Louis Vuitton – is the ultimate inkblot. Self-conscious, of course, is Frank Gehry’s middle name, as Martin Filler’s less-taken take in the New York Review of Books indicates. Gehry’s postmillennial work tends to be anything but humble, especially the extravagant Fondation Louis Vuitton, which is the equivalent of fifteen stories high and from certain angles imparts the overbearing aggressiveness projected by the tilting Cor-Ten steel sculptures of his competitive friend Richard Serra. The Vuitton building, which occupies a verdant site in the northern part of the Bois de Boulogne, has been an instant popular hit. It continues a long history of Parisian modern wonders at once novel and bizarre, typified by the Montgolfier balloon, Foucault’s pendulum, the Eiffel Tower, and the Spirit of St. Louis, which combined technological novelty with conceptual audacity and drew tout le monde to gawk at the latest sensation. And draws them now to gawk at endless Louis Vuitton marketing, which is notably absent from the much more artistic Fondation Cartier, according to Filler. An admirable example of a contemporary art center built by a luxury goods purveyor is the Fondation Cartier, which was founded in 1984 and this year celebrates its twentieth anniversary in the wonderful building designed for it on the Boulevard Raspail by Jean Nouvel. One of his strongest yet most discreet designs, this rectilinear, multilayered glass-walled structure has aged exceptionally well. More importantly, the Fondation Cartier’s programming has been consistently excellent, as exemplified by its current show, “The Inhabitants” (curated by the artist Guillermo Kuitca with works by himself as well as Francis Bacon, Vija Celmins, David Lynch, and Patti Smith, among others), a juxtaposition of disparate works that make a great deal of subliminal sense when viewed together. Versus Gehry’s work, which makes mostly commercial sense. At least so far. Meanwhile: Dommage, Bois de Boulogne. This entry was posted in Uncategorized and tagged Bois de Boulogne, Boulevard Raspail, Bulgari, David Lynch, Dior, Donna Karan, Eiffel Tower, Eisenhower Memorial, Fendi, Fondation Cartier, Fondation Louis Vuitton, Foucault's pendulum, Francis Bacon, Frank Gehry, Frank Lloyd Wright, Gehry's Folly, Givenchy, Grand Palais, Guggenheim Museum Bilbao, Guillermo Kuitca, Jean Nouvel, Joel Henning, LMVH, Martin Filler, Moet Hennessy, Montgolfier balloon, New York Review of Books, Patti Smith, praeterition, Solomon R. Guggenheim Museum, Spirit of St. Louis, Vija Celmins, Wall Street Journal, Walt Disney Concert Hall. Bookmark the permalink. All interesting works of art, unless you have to pay for them, live or work in them, or maintain them. Check out the Stata center as MIT–same thing: cost 50% more than budgeted, costs a fortune to maintain, is actually very inefficient for intended use–your tax and tuition dollars at work. Yeah – it’s a hot mess, Bill. I prefer his coquille at Churchy LaFemme. I knew you would, Mick. Not sure that I’d be interested in having the office in the upper right-hand corner in the picture that you’ve used. Yeah – that’s the Alfred Hitchcock Memorial Vertigo Room.